Crises Control has taken the top prize of Cloud DR and Continuity product of the year at the Computing Magazine Cloud Excellence Awards. Managing Director Shalen Sehgal picked the prize that is awarded for solutions that in the opinion of judges delivers the most reliable service, that innovates and provides important features that help users enhance their business resilience. Crises Control is a business continuity and recovery tool whose fundamental design is based on optimising the opportunities offered by the cloud to enhance business resilience. This is the third award in a row for Crises Control having previously won CIR Risk Management awards in 2016 and 2017. The Crises Control solution makes use of the Cloud by providing cloud hosted storage and uses the software-as-a-service model to ensure that the service is always available. Critically, the system works even when the customer's own IT networks are placed out of action or inaccessible making it especially useful for organizations without deep pockets and resources. The Integrated system also makes use of a cloud telecommunications platform to support global multi-channel communications. This service provides 24/7 e-mail, SMS, voice to text, push notifications and conference calls to customers and ensures that in the event of a crisis, the message will be guaranteed to get through via one or more of the channels available. The solution provided takes mass notification a step further with easy compliance with EU GDPR reqquirements and solutions that are flexible enough to cope with large scale deployments as well as dedicated SME packages that help smaller companies develop the business resilience their customers expect without incurring time and cost usually needed to implement world class capabilities. If you would like to learn more Crises Control have produced some useful introductory videos to provide further help and guidance. The International Standards Organisation has issued the Draft for Public Comment (DPC) for its new standard covering Organizational Resilience - Principles and Guidelines | ISO 22316. This International Standard provides guidance to enhance organizational resilience for any size or type of public or private organization and is not specific to any industry or sector. It can be applied throughout the life of an organization. The British Standards Institution (BSI) has published guidance standard for organizational resilience. The standard BS 65000:2014 | guidance on organizational resilience was first mooted more than five years ago and has passed through a number of major development stages prior to its final publication last year. This webcast introduces the Continuity Forums Climate Adaptation Programme (CAP). The Climate Adaptation Programme is a core project that focuses on more effectively connecting Risk and Business Continuity Management with Climate Adaptation. In this Webcast we provide an introduction to the reasons behind the project and share a brief outline of the activities and benefits planned. The European Commission, pursuing the increase of the global competitiveness of EU security industry while enhancing the security of Europe, has requested the European Standardisation Organisations (ESOs) to draft three European standardisation roadmaps in the security sector under action 1 in their Communication on Security Industrial Policy. 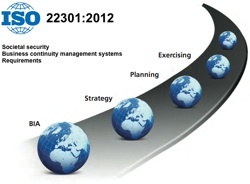 BS ISO 22313 Societal security — Business continuity management systems — Guidance offers global best practice to organizations implementing an effective Business Continuity Management System (BCMS). Acting as the guidance document for ISO 22301, the standard provides a more intuitive framework to those pursuing business continuity best practice. It is a key milestone to support the uptake and implementation of effective BCM worldwide. Together, these BCM standards seek to support organizations in their on-going challenge to improve business resilience in the face of unforeseen circumstances such as bad weather or civil unrest. The session is part of the Continuity Forum webinar series and was first broadcast in September 2012. Hilary Estall of Perpetual Solutions is our guest for the session and she outlines how the migration can be more easily made from other standards such as BS 25999-2 to the new ISO and what the auditor is likely to focus on when assessing your system. This video is approximately 48 minutes long. The Cyber Risk Insurance Forum (CRIF), the group established to develop a security framework for companies taking out cyber insurance, has held its inaugural meeting, expanding its membership and developing two lines of focus for its on-going campaign. Global information assurance firm NCC Group, with Liberty International Underwriters (LIU), Zurich Insurance, CNA Europe and Oval, established the group earlier this year under the Cyber Insurance Working Group title. The founding members have now increased to include Thales, Continuity Forum, ACE Insurance and Hill & Knowlton, bringing together a broader spectrum of thought leaders. The Cyber Risk Insurance Forum seeks to develop a framework of recommended information security practices and policies to support the uptake of cyber insurance, protecting insurers and businesses alike. The name change was implemented following the group’s first meeting, as part of a concerted focus on risk mitigation. Matthew Hogg of LIU, a founding Member of CRIF explains: “We realise from our discussions with industry that a two-pronged attack is necessary to drive our campaign forward." This five-day course will run week commencing 03/09/2012 in Cardiff City Hall reduced from £2000 to £1175. This course has been commissioned by Cardiff City Council and is being offered to Continuity Forum members, at cost, at the significantly discounted rate of £1175 + VAT. The advertised rate of this course is usually in the region of £2000 + VAT so this presents a fantastic saving for anyone wishing to attend this particular offering. All course materials, the course exam, refreshments and lunch are included. â€¨â€¨Please note places are limited so early booking is advised. The rate may be negotiable for multiple bookings. Our Webinars focusing on the new ISO Business Continuity Standard 22301 really have been incredibly popular with a response that has even taken us by surprise! Following on from the Continuity Forum Webcasts in May, June and July we are adding four more sessions starting in late August and through September covering the next steps for organisations. We are now taking bookings and places will be limited so prompt action is recommended.